While many hotels and resorts in Los Cabos offer all inclusive packages, only a handful of resorts offer the complete all inclusive experience. This means that all of your food and drinks are unlimited 24/7 and that almost all (if not all) of the other guests are on the same plan. While some activities and more expensive liquors may not be included, most all inclusive resorts in Los Cabos include planned activities. As with all resorts in Los Cabos, it is important to note that there are all inclusive resorts in both Cabo San Lucas and San Jose del Cabo as well as in the 45 meter Corridor between them. 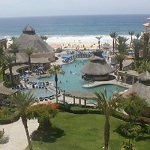 The following all inclusive resorts are in the Los Cabos region of Baja California Sur. They are sorted by location. Clicking on the “Visit Website” links will take you to where you can book your hotel. While many Cabo San Lucas hotels offer all inclusive packages, there are surprisingly few “true” all-inclusive resorts in Cabo San Lucas. The Pueblo Bonito all inclusive resorts are on the Pacific side while both of the RIU Santa Fe and the RIU Palace are on the eastern side, just past Medano Beach. With full amenities such as an holistic spa and award winning restaurants, the Pacifica is an intimate luxury experience with the stress-free addition of being all inclusive. Unlimited food and drinks, wine and tequila tastings, and daily wellness activities are all included with your stay. 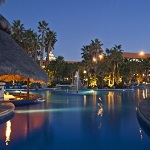 The Riu Palace Cabo San Lucas is one of the more popular all inclusive resorts in Cabo San Lucas. Located on the eastern edge of Playa Medano right next to the Riu Santa Fe, you can enjoy all of the amenities at both hotels. it has lots of activities and many specialty restaurants. 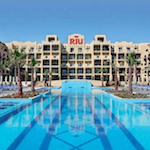 The Riu Santa Fe, near Cabo San Lucas,is the perfect all inclusive resort for active vacationers. You can participate in numerous water sports, golf, volleyball, and many more great activities. Additionally, the Riu Santa Fe also has multiple great restaurants with various cuisines, 2 swimming pools, a Jacuzzi, a gym, sauna, steam bath, and their “Renova Spa,” which will pamper you head to toe. While not in either of the towns, all inclusive resorts in the Los Cabos Corridor are located close to many of the golf courses. These resorts often offer packages for golfers. Dreams Los Cabos is located just south of San Jose del Cabo in the corridor. At Dreams every room is a suite that is filled with lavish decorations. Although, the luxury accommodations don’t stop there. 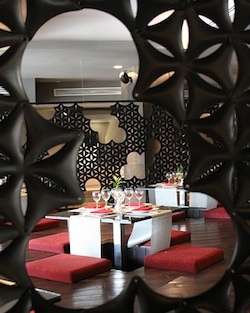 Dreams also has multiple gourmet restaurants and bars, and a staff that’s ready to serve you. There is also a whole multitude of great events day and night to keep you, your family and friends entertained. 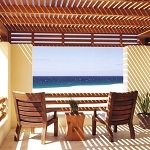 The Melia Cabo Real is one of Cabo’s most complete all inclusive resorts. It has state of the art accommodations and amenities. The resort is situated by the beautiful Cabo Real Championship Golf Course. The course offers the perfect blend of Cabo’s desert beauty with the sea of cortez as a backdrop. 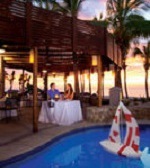 The Melia Cabo Real also offers 4 unique dining experiences that are sure to immerse all of your senses. Themed nights are held on a regular basis and help make each meal a memorable one. 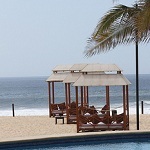 The Zoetry del Mar Resort is located in one of Cabo’s nicest areas. 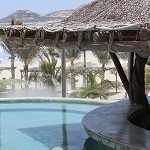 Even among many of Cabo’s beautiful villas, the Zoetry del Mar’s hacienda-style boutique resort certainly stands out. In addition to the Zoetry del Mar’s unique decor, the resort also has luxurious suites, premium food and drinks for every meal, access to the nearby Dreams Los Cabos resort and all it’s facilities, as well as daily fruit and champagne. The Barceló Los Cabos is situated at the Golden Zone in San Jose del Cabo, Barceló Los Cabos. Just 5 min. from downtown San Jose del Cabo and 20 min. from Los Cabos International Airport. Offering world-class shopping and dining experience near sandy beach with spacious accommodations and superb facilities. Hotel having 250 rooms at this 5-star hotel blends expert service with luxurious facilities to provide guests a memorable stay. With authentic Latin hospitality, the Hola Grand Faro Los Cabos luxury all-inclusive resort is a great destination for an all-inclusive wedding, family reunion or other getaway. 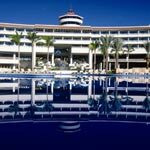 Within its walls, the Hola Grand Faro has 5 swimming pools, large conference spaces, a kids’ club as well plenty of themed restaurants. Hola Grand Faro features a 2 story lighthouse, “Faro” in Spanish, that offers a great vantage point for the Los Cabos area. 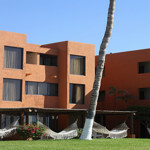 The Holiday Inn los Cabos is an all inclusive resort located at the eastern end of the hotel zone in San Jose del Cabo. Located next door, the San Jose del Cabo Estuary offers great opportunities for bird watching and horseback riding. Formerly known as the Presidente, this hotel was one of the first resorts in San Jose del Cabo and features traditional architecture of the area. All meals and drinks are included. Located near downtown San Jose del Cabo, the Royal Solaris is a hotel that will offer a great experience for the whole family. This all inclusive resort includes everything from a water park to great kid friendly activities. Temptation Los Cabos Resort, formerly Desire Resort, is an adult-only all inclusive resort in San Jose del Cabo. The Temptation Los Cabos Resort offers those guests over 21 a chance to relax and enjoy all of Cabo to the finest with a chance to mix and mingle. Temptation has plenty of adult only themed activities as well as the standard good food and accomodations that you would expect from an all inclusive resort in Cabo. Please visit our Hotel Directory for a complete listing of hotels and resorts in Los Cabos.